Rarely are résumés or curriculum vitae (CVs) presented as lone documents; in the majority of cases, a "covering letter" is attached. Typically, this cover letter contains information that expands upon the CV contents. Below, we'll look at various cover letter elements and why they are essential or helpful. Additionally, your cover letter should contain no graphics beyond a logo (if applicable). The purpose of this communication isn't to entertain; it's to inform. Thus, keep the font simple (and no less than 11 points) by sticking to one font style throughout the whole piece. I noticed with interest your job advertisement for a mid-level accountant in the "XYZ Times". Therefore, I am submitting my CV (see attached) for your consideration. Your opening lines do not have to be long or flowery; keeping the message simple will encourage your recipient to continue reading. Once you've gotten past your introductory paragraph, you're ready to tackle the "meat" of your cover letter. It is during this portion of your missive that you'll be "selling" yourself. "As a public relations professional for nine years, I have had many opportunities to promote products and services, work with a variety of media outlets, and attend conferences to increase my PR knowledge." Even though you have probably already indicated that you are a qualified applicant in your CV, it's expected that you will somewhat repeat yourself in the cover letter, as indicated in the sample above. When ending your CV cover letter, make sure you include your contact information. That way, your recipient can reach you for more information. Also, be polite; never forget to say "thank you" in some way. Not only is it considered proper etiquette to do so, it speaks volumes about you as a person. When you sign your cover letter (unless it's sent via email), do as you would all business correspondence. This means you should use only blue or black ink; the use of other ink colors or pencils is considered inappropriate and unprofessional. Though a few business persons choose to write long cover letters, it's usually not necessary. Keeping yours short is generally best. Additionally, some people are unsure whether to paper clip or staple their cover letter to the CV. 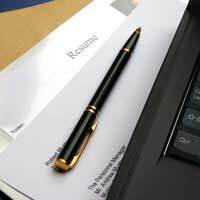 Again, this is a personal preference; just keep in mind that some recipients have the habit of removing the cover letter anyway if many copies of the CV are to be made. Lastly, remember that your cover letter is a professional document. Even if you know your recipient well, it's best to keep all the wording on a business level. And, of course, proofread everything twice; grammatical errors tend to stand out on cover letters and can detract from the value and impact of your CV. good website to download free templates, thank you. I'd say you should keep the cover letter brief and to the point. A short introduction, no more than three lines, and then three more, possibly four, about why you feel you'd be the ideal person for the job. It should be just enough for someone to put your CV on the 'to be read' pile without going overboard - your CV should be the convincing document. Remember, it's a cover letter, not a long argument in favour of yourself; use a little space very effectively.